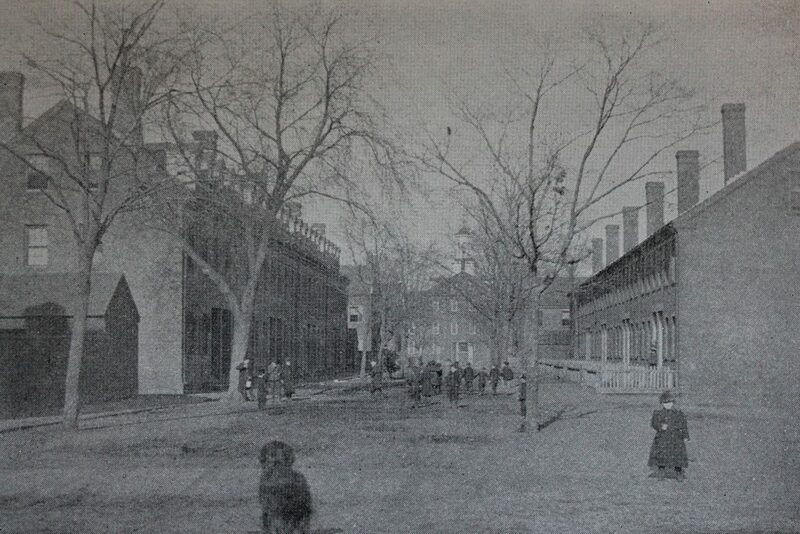 Looking north on Center Street from the corner of Lyman Street in Holyoke, around 1892. Image from Picturesque Hampden (1892). 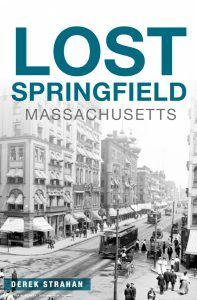 Holyoke was once the sparsely-settled northern section of West Springfield, but in the mid-19th century it developed into a major industrial center, thanks to its location at a major waterfall on the Connecticut River. The Hadley Falls Company played a key role in this transition, including constructing a dam and an extensive canal system to provide water power for the factories that were soon to be built. These projects were completed in the late 1840s, around the same time that the Hadley Falls Company built a mill, which can be seen in the distance in the center of these photos. The mill was accompanied by a group of tenement rowhouses for workers, as shown in this scene. These were constructed starting around 1848, and a total of six buildings would eventually be completed. However, an 1853 map shows only four, with one on each side of the block bounded by Center, Canal, Grover, and Lyman Streets. This included the one on the left side of Center Street, but the one on the right did not appear on the map. However, it was evidently completed a year or two later, because it appears on the 1855 map of Hampden County. Both buildings had similar Greek Revival-style architecture, although the ones on the right were evidently not built with dormer windows, as the first photo indicates. Convenient boarding-houses are erected for the use of the operatives. These are owned by the company, and rented, at comparatively low rates, to respectable keepers. They are built of brick, in the most substantial style, and are supplied with all the usual conveniences of modern dwelling-houses. The tenants of the boarding-houses are no to board, or permit any part of their houses to be occupied by any person not in the employ of the manufacturing department of the Hadley Falls Company, without special permission; and when required, give an account of the number, names, and employment of their boarders, and report the names of such as are guilty of improper conduct. They will be considered answerable for any improper conduct in the house, and not permit their boarders to have company at unseasonable hours. The doors to be closed at ten o’clock in the evening. They are also requested not to allow their boarders or other persons to collect on the front steps, or side-walk in front of the tenement. The buildings, yards, and front walk of each tenement must be kept clean and in good order; and if injured, otherwise than from ordinary use, all necessary repairs will be made and charged to the occupant. The rents must be paid monthly, and within three days after the operatives have been paid in the factory. The Holyoke Water Power Company later took over operation of the dam and the canals from the Hadley Falls Company, following the economic recession caused by the Panic of 1857. By the 1860s, the mills and tenements were acquired by the similarly-named Hadley Company. It was part of Holyoke’s lucrative textile industry, and produced a variety of threads, yarns, and twine at the mill in the distance. The first photo was taken several decades later, and shows a group of young children, presumably the children of the mill workers, walking along Center Street. The 1900 census shows ten families living in the tenements on the right side, and 14 on the left. The vast majority of these families were immigrants, with most coming from Ireland or Quebec. For example, the rowhouse at 20 Center Street, closest to the camera on the right side of the photo, was rented by Bridget Barrett, a 65-year-old widow who had arrived in the United States in 1865. She was widowed by 1900, and only two of her five children were still alive. These two daughters, Mary and Bridget, had been born in England, and were only a few years old when they immigrated to the United States. Mary was 38 and unmarried during the census, and the younger Bridget was, like her mother, a widow with two surviving children. At the time, Mary worked as an inspector in the thread mills, the younger Bridget was a nurse, and her 17-year-old son James was a spinner at the thread mills. On the other side of the street, the rowhouse on the far left at 15 Center Street was occupied by two families. One unit was the home of John and Susan Platt, and their son Edward. All three were born in England and came to the United States in 1890, and by 1900 John was working as a machinist and Edward as a paper cutter. The other unit at 15 Center Street was evidently more crowded. It was the home of Pierre and Christian Chartier, French-Canadian immigrants who arrived in 1896. They had a total of 11 children, nine of whom were still alive by 1900. Of these, seven were living here during the census, with ages that ranged from 12 to 26. The youngest child was still in school, but the rest were working at nearby mills, with jobs that included cotton spoolers, a tailor, a paper sorter, and a cotton spinner. In addition, the family also lived here with a 24-year-old French-Canadian boarder, who also worked in the mills as a spooler. In the meantime, the Hadley Company had been acquired by the American Thread Company in 1898. The mill remained in operation as the Hadley Division of the company, but it closed in 1928, leaving about a thousand employees out of work on the eve of the Great Depression. 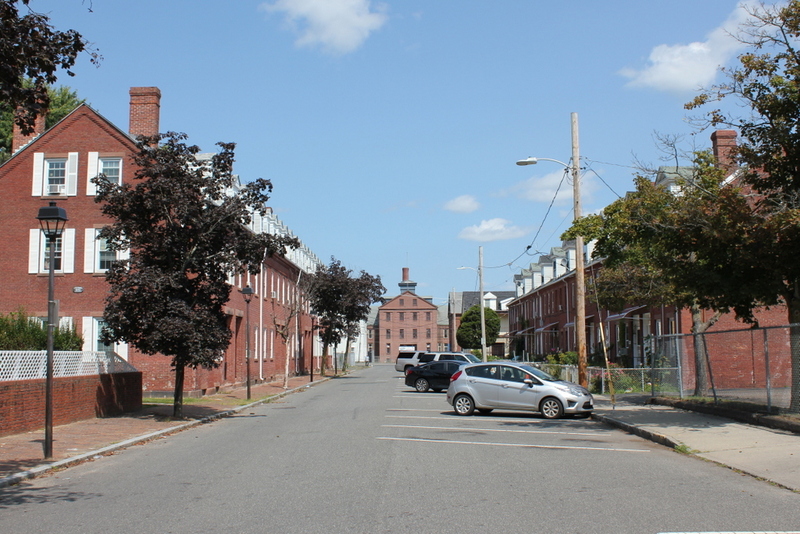 Over the years, Holyoke’s industrial base would continue to decline, along with its population. The 1920 census recorded just over 60,000 residents, but this number would steadily drop throughout the rest of the 20th century, eventually dropping below 40,000 in the 2000 census. During this time, many mills and other historic buildings were abandoned, and a number of them have since been demolished. However, the Hadley Company mills and the adjacent worker tenements have, for the most part, survived relatively well-preserved. One of the tenements, which had been located along Canal Street between Center and Grover Streets, is now gone, but the other five have survived. 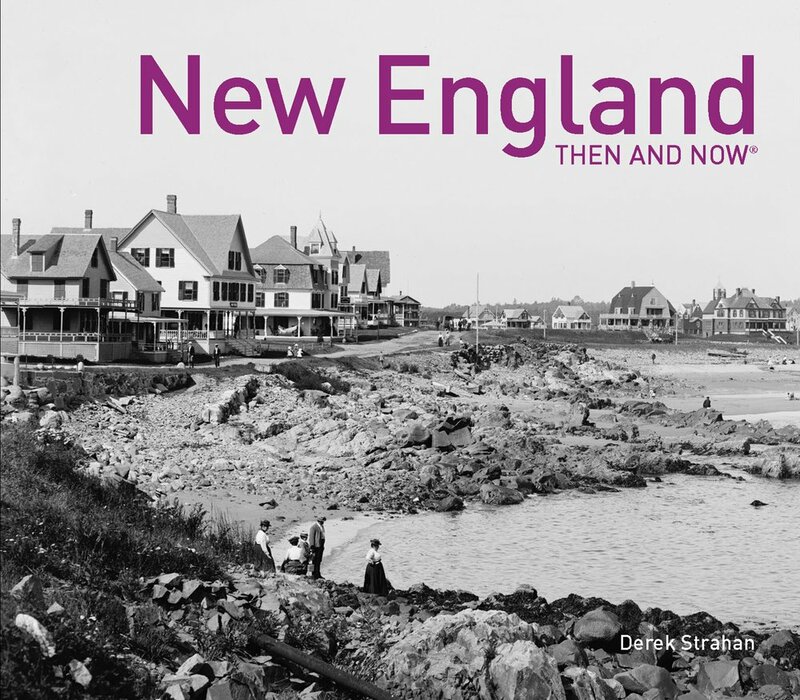 The ones here on Center Street were restored in the 1970s, and today the scene does not look substantially different from its appearance 125 years ago, aside from the addition of the dormer windows on the right side. These buildings, along with the other three tenement buildings, now comprise the Hadley Falls Company Historic District, which was added to the National Register of Historic Places in 1972.